Equity Research Report - An Inside Look at What's Actually Included! An equity research report is a document prepared by an AnalystEquity Research AnalystAn equity research analyst provides research coverage of public companies and distributes that research to clients. We cover analyst salary, job description that provides a recommendation on whether investors should buy, hold, or sell shares of a public companyPrivate vs Public CompanyThe main difference between a private vs public company is that the shares of a public company are traded on a stock exchange, while a private company's shares are not. There are several more important differences to understand. Additionally, it provides an overview of the business, the industry it operates in, the management team, its financial performanceAnalysis of Financial StatementsHow to perform Analysis of Financial Statements. This guide will teach you to perform financial statement analysis of the income statement, balance sheet, and cash flow statement including margins, ratios, growth, liquiditiy, leverage, rates of return and profitability. See examples and step-by-step instruction, risks, and the target price. 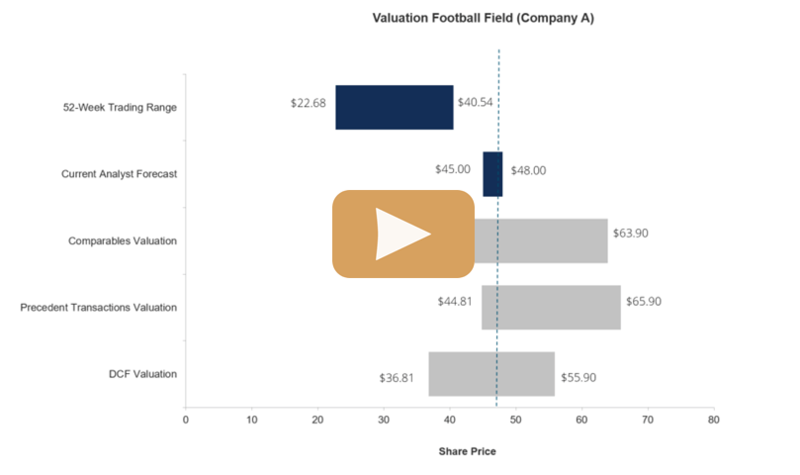 To learn more, check out CFI’s Valuation Modeling Classes. Let’s take a closer look at what’s included in an equity research report. Below is a list of the main sections you’ll find in one of these reports. Recommendation – Typically to either buy, sell, or hold shares in the company. This section also usually includes a target price (i.e., $47.00 in the next 12 months). Company Update – Any recent information, new releases, quarterly or annual results10-KForm 10-K is a detailed annual report that is required to be submitted to the U.S. Securities and Exchange Commission (SEC). The filing provides a comprehensive summary of a company’s performance for the year. It is more detailed than the annual report that is sent to shareholders, major contracts, management changes, or any other important information about the company. Investment Thesis – A summary of why the analyst believes the stock will over or underperform and what will cause it to reach the share price target included in the recommendation. This is probably the most interesting part of the report. Financial Information & Valuation – A forecast of the company’s income statementIncome StatementThe Income Statement (or Statement of Profit and Loss) shows performance from operations of a business. The financial statement begins with revenues and, balance sheet, cash flowThe Ultimate Cash Flow Guide (EBITDA, CF, FCF, FCFE, FCFF)This is the ultimate Cash Flow Guide to understand the differences between EBITDA, Cash Flow from Operations (CF), Free Cash Flow (FCF), Unlevered Free Cash Flow or Free Cash Flow to Firm (FCFF). Learn the formula to calculate each and derive them from an income statement, balance sheet or statement of cash flows, and valuation. This section is often an output from a financial modelTypes of Financial ModelsThe most common types of financial models include: 3 statement model, DCF model, M&A model, LBO model, budget model. Discover the top 10 types of Excel models in this detailed guide, including images and examples of each. Financial modeling is performed for many reasons including to value a business, raise money built in Excel. Risk & Disclaimers – An overview of the risksRisk and ReturnIn investing, risk and return are highly correlated. Increased potential returns on investment usually go hand-in-hand with increased risk. Different types of risks include project-specific risk, industry-specific risk, competitive risk, international risk, and market risk. associated with investing in the stock. This is usually a laundry list that includes all conceivable risks, thus making it feel like a legal disclaimer. The reports also have extensive disclaimers in addition to the risk section. It’s important to distinguish between buy side and sell side research reports. Buy sideBuy-SideInstitutional asset managers, known as the Buy Side offer a wide range of jobs including private equity, portfolio management, research. Learn about the job firms (asset management companies) have their own internal research teams that produce reports and recommendations on which stocks the firm and its portfolio managersPortfolio ManagerPortfolio managers manage investment portfolios using a six-step portfolio management process. Learn exactly what does a portfolio manager do in this guide. Portfolio managers are professionals who manage investment portfolios, with the goal of achieving their clients’ investment objectives. should buy and sell. The reports are only used for internal investment decision making and not distributed publicly. Sell sideSell Side AnalystA sell side analyst is an equity research analyst who works for an investment bank or brokerage firm and produces investment research which is circulated to the firm's clients. The investment research is later used by the client to make a decision on whether to buy or sell firms such as investment banks produce equity research reports to be disseminated to their sales and trading clients and wealth management clients. These reports are distributed for free for a variety of reasons (explained below) and have a specific recommendation to buy, sell, or hold as well as an expected target price. Learn more about buy side vs sell sideBuy Side vs Sell SideBuy Side vs Sell Side. The Buy Side refers to firms that purchase securities and include investment managers, pension funds, and hedge funds. The Sell Side refers to firms that issue, sell, or trade securities and includes investment banks, advisory firms, and corporations. Learn similarities and differences jobs. Why Do Banks Publish Equity Research Reports? The sell side publishes reports to generate fees, both directly and indirectly. When an investment bankList of Top Investment BanksList of the top 100 investment banks in the world sorted alphabetically. Top investment banks on the list are Goldman Sachs, Morgan Stanley, BAML, JP Morgan, Blackstone, Rothschild, Scotiabank, RBC, UBS, Wells Fargo, Deutsche Bank, Citi, Macquarie, HSBC, ICBC, Credit Suisse, Bank of America Merril Lynch publishes valuable equity research for an institutional client, that client is then likely to use the bank to execute their trades for that stock. While there no actual agreement to do so, it’s an unspoken rule. The bank may also use the report to persuade the client to buy more shares in a holding they already have, to therefor further increase commissions. All banks have a Chinese WallChinese WallIn finance, a Chinese Wall (or a Wall of China) is a virtual information barrier erected between those who have material, non-public information and those who don’t, to prevent conflicts of interest. A bank uses a Chinese Wall policy to comply with securities regulations. between their investment banking teams and research departments, but there still remains an indirect incentive for research to be supportive of stocks the bank may provide investment banking services to. The fees that investment bankersWhat do Investment Bankers do?What do Investment Bankers do? Investment bankers can work 100 hours a week performing research, financial modeling & building presentations. Although it features some of the most coveted and financially rewarding positions in the banking industry, investment banking is also one of the most challenging and difficult career paths, Guide to IB earn on underwriting and mergers and acquisitions (M&A) are huge, and a bank would never want to miss out an opportunity to work with a CEOCEOA CEO, short for Chief Executive Officer, is the highest-ranking individual in a company or organization. The CEO is responsible for the overall success of an organization and for making top-level managerial decisions. Read a job description of a public company because the bank had a “Sell” rating on their stock. Each bank has their own set of recommendations (terms) they use to rate a stock. Below is a list of the most common recommendations or rating analysts issue. To learn more, check out CFI’s Valuation Modeling Courses. This guide has focused on a “typical” equity research report, but there are various other types that can take slightly different forms. Below is a list of other types. Initiating Coverage – A long report (often 50-100+ pages long) that is released when a firm starts covering a stock for the first time. Industry Reports – General industry updates about a few companies in a sector. 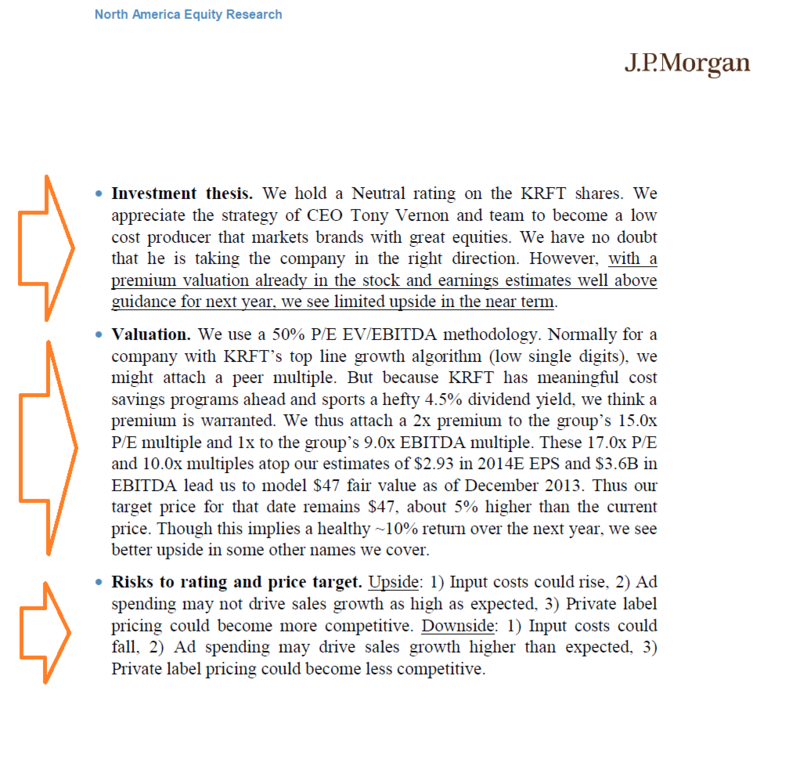 Top Picks – A list and summary of a firm’s top stock picks and their targeted returns. Quarterly Results – A report that focuses on the company’s quarterly earnings release and any updated guidance. Flash Reports – Quick 1-2 page report that comments on a new release from the company or other quick information. 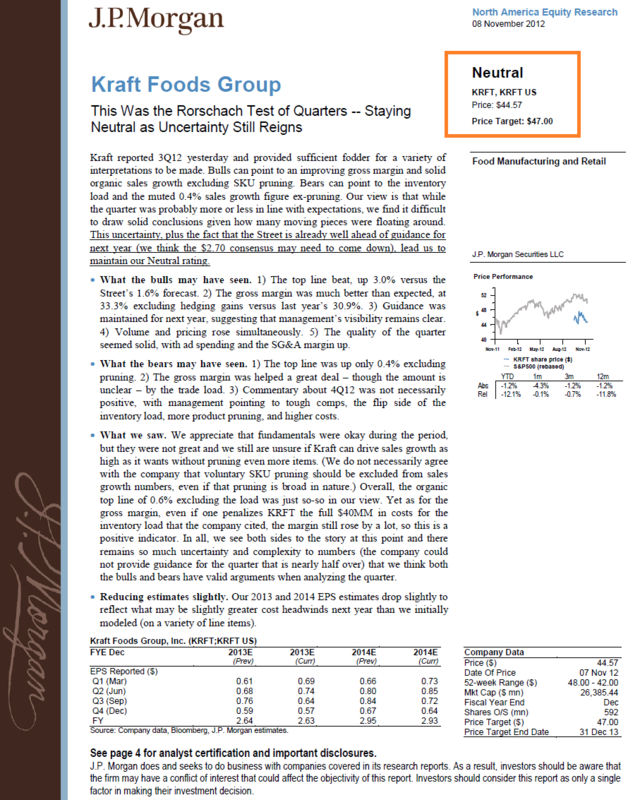 Below is an example of an equity research report on Kraft Foods. As you can see in the images below, the analyst clearly lays out the recommendation, target price, recent updates, investment thesis, valuation, and risks. 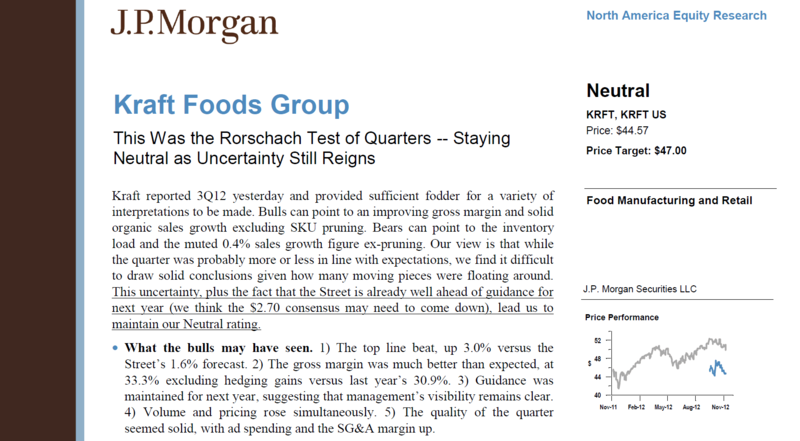 Thank you for reading this equity research report guide. CFI is the official provider of the Financial Modeling & Valuation Analyst (FMVA)™ certificationFMVA™ CertificationThe Financial Modeling & Valueation Analyst (FMVA)™ accreditation is a global standard for financial analysts that covers finance, accounting, financial modeling, valuation, budgeting, forecasting, presentations, and strategy. program, designed to help professionals working in investment banking, equity research, and other areas of corporate finance.